Run and gun basketball is exciting high scoring style offense. Today in the NBA, teams coached by Mike D’antoni and Don Nelson are identified by this style of play. Considered by many as a breath of fresh air, it made the game "fun" to watch again due to its fun up and down nature and the high scoring. 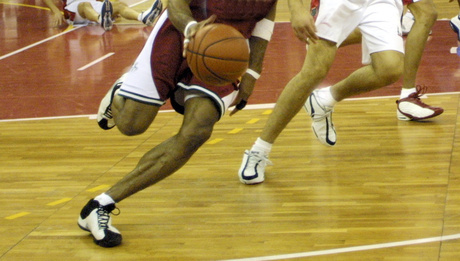 Soon as the ball is rebounded, stolen, or is coming off a made basket, the team that was previously defending PUSHES the ball to the other end of the court as quickly as possible through the use of passing and dribbling. Often times, the priority is to get the ball to the point guard right away so he can start the break. Other times, most if not all five players are given the green light to push it themselves. It’s important that as soon as the break starts, every player be prepared to receive the pass and also look ahead for the next pass or the score. a highly skilled point guard with high level passing abilities. The criticism for the run and gun style of play is that teams that play this way don’t play defense or, at least, don't play good defense. As opposed to the traditional half-court offense and defense, this style focuses on scoring, and scoring a lot. Here's a nice video of the Lakers getting a steal; IMMEDIATELY every player starts running and looks down court. The pass goes to Kobe Bryant and he takes care of the rest.